Go on a Fall walk through the school neighborhood, collecting colored leaves, acorns, etc. in lunch bags or in student-created “Baskets of Beauty”. Before the walk, sit in a quiet spot and have the children close their eyes. Speak in hushed tones. Ask them to listen carefully to the sounds they hear. Ask them to smell the scents of autumn. Weather permitting, have them lie on their backs and look at the fall sky. While on the walk, look for colorful leaves, seeds, nuts, flowers, squirrels, and migrating birds. Take along some magnifying glasses for a closer look. Collect a few leaves of various colors, nuts and seeds. Later, discuss how the leaves, nuts and seeds are the same and different, how they smell, could they be eaten, and how they feel. Make a regular graph or a use masking tape to create a floor graph to show the colors of their favorites. We also used tiny candy leaves (the ones you usually sprinkle on frosting) to make individual leaf graphs. Copy this Fall Concentration game on two colors of paper. Use as a center or as a take-home activity to review the signs of fall. Copy this fall leaves blackline of 9 leaves on three different colors of paper to use for sorting activities. Sort the leaves by color, shape and size. Give students a copy of each color to cut up and use at home for sorting practice. We learned that there are other colors “hidden” in the leaves, but the green color covers them up. In the fall, the other colors in the leaves can be seen when they change colors. Use a popsicle stick to rub some of the green color (chlorophyll) from a green leaf on to a coffee filter strip. You can see some of the green color here. Take out the strip and dry. There is a small band of yellow color that separated from the green. We made a book about some leaf activities. Cut the pages in half. The first page consists of a cover. On the next page, the children either draw or trace a leaf and describe it. Cubes are used to measure the leaf on page 3. On page 4, the children drop their leaves and record how high they can count before their leaf reaches the floor. On page 5, the children measure the area of their leaf by covering it with pennies. On the last page, the children discover that their leaves float. Then they place one penny at a time on their leaf to discover how many pennies it will take to sink their leaf. Click on the link if you would like a copy of the Leaf Book. Trace a child’s arm and hand to make a fall tree. Glue colored tissue pieces on for the leaves. Make a fall wreath by gluing leaves and acorns to a paper plate with the center cut out. This is a TLC type scarecrow where the children cut and glue on shapes and then embellish it with crayon drawings. This scarecrow pouch was made by cutting a foam plate in half and lacing the edges together with rope. The children drew on a face, glued on a bow, and stuffed it with straw. These are examples of rotating center activities to celebrate the season. Parent volunteers and teachers are in charge of these centers and classes rotate to a new center every 20 minutes (or any designated time limit). This can be done with all of the kindergarten classes or in one classroom on a smaller level. Click here for additional center ideas that are Halloween related. Have the children decorate sugar cookies. Add a drop of red and yellow food coloring to white frosting in a dixie cup. The children stir it and frost the cookie. They may also add decorations–sprinkles, M&M’s, etc. Do spider web paintings, rolling marbles in white paint and then over black paper. Attach spider rings when dry. List fall words and then write a story and illustrate a picture. Find the letter in the hay. Fill a large tub with hay and add large letters for them to find and match to a fall item, such as “I” by the Indian Corn, etc. Make book marks with fall stamps. Glue sunflower seeds onto a sunflower worksheet that has numbers in the center of each flower. (such as 5). Loved your Leaf Book! Thanks so much! 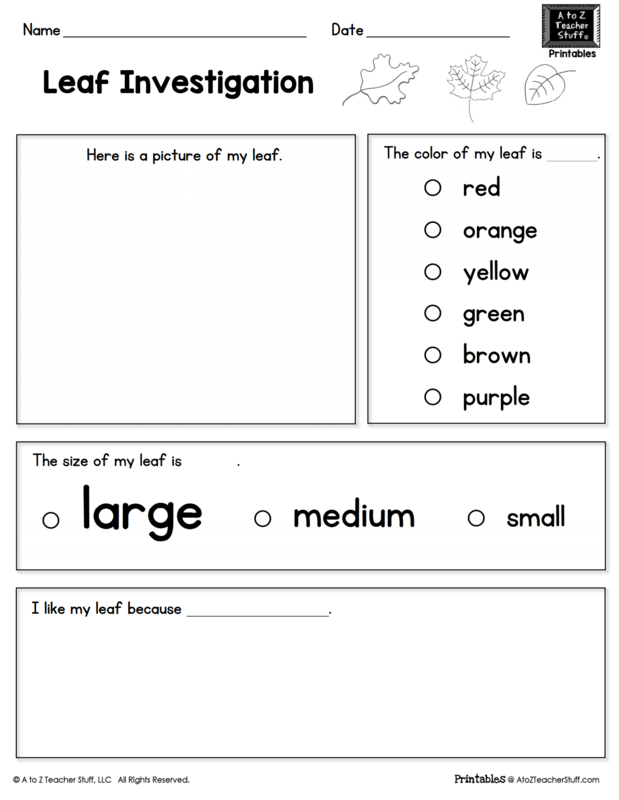 How can we get a copy of the leaf report worksheet? I LOVE this idea!!!! Great ideas for a ‘leaf’ themed week! Thanks! What a nice ideas, I just love the leaf report. Is it possible to find the report somewhere as a worksheet, and not just as a photo? Leave a Reply to Charmaine Click here to cancel reply.